A half-day excursion which shows you the most beautiful sights of the southern part of the Vienna Woods. Passing the Roman City of Baden which is famous for its thermal springs, we drive through the romantic valley Helenental to the former Mayerling hunting lodge, (visit of memorial chapel), where Crown Prince Rudolph together with Baronesse Vetsera died tragically in 1889. In the Cistercian Abbey of Heiligenkreuz (1133) you visit the medieval cloister which houses the remains of the last Babenberger. 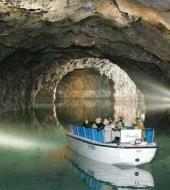 We then pass the Höldrichsmühle and arrive at the Seegrotte. After a boat ride on the largest subterranean lake in Europe you leave the Vienna Woods and return to Vienna. This tour is available in German, English, and Spanish. Please arrive 15 minutes prior the tour. This tour starts at 9.15 a.m.